Yet another weekend lost to the pleasures (or pains) of work, depending on your point of view. Actually, we have been working on some very interesting fusion of augmented reality and social media - to be more precise, the creation of an augmented reality monitor that runs of live Twitter ticker feed. 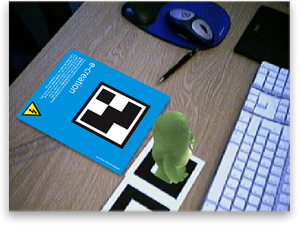 We can edit and adjust the content of the augmented reality file using Twitter, which is pretty cool. Hopefully, we will be creating a new version of the www.augmentedrealitydesign.com site next week where users will be able to enter their own Twitter name and the application will automatically create a unique augmented reality Twitter feed that they can send to friends and colleagues, getting the viral wire buzzing. It's a pretty cool application, so thank you Paul for working so hard over the weekend to meet our deadline for Kraft in the USA. Fingers crossed that Kraft will be taking on E-creation's augmented reality design creativity and applying it to their packaging. Visit www.augmentedrealitydesign.com to interact with E-creation's augmented reality Twitter ticker - it's pretty cool!